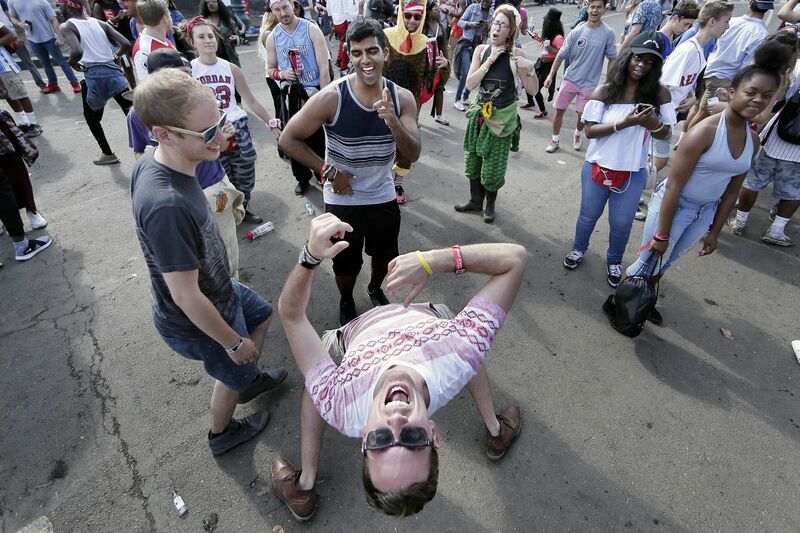 Bruce Gondeck dances in the street during the Budweiser Made In America festival on the Ben Franklin Parkway in 2017. After years of griping over parking, noise, and litter associated with the 19 or so major events that take place each year on the Benjamin Franklin Parkway, neighbors finally got the city to do something. Working with residents, the Parkway museums, and other institutions, officials conducted extensive research and created a scorecard to determine what events should be held there. Then — after an angry op-ed from Jay-Z sparked a media firestorm — Mayor Kenney threw it out the window. At least that's how it feels to area residents like Drew Murray, who worked on the Parkway events study. Though he is also president of the Logan Square Neighborhood Association, he did not learn until after the fact that Kenney on Monday had walked back his decision to banish the Made in America music festival from the Parkway. If Jay-Z, who founded the festival, was blindsided by the initial decision, neighbors have been just as startled by its reversal. "We were surprised and disappointed that the mayor revised the decision without speaking to the residents first, and most likely not factoring in the scorecard that was developed as part of the Parkway events study," Murray said. "Roc Nation [Jay-Z's company] is a stakeholder, but the residents are stakeholders as well. We would have rather had those conversations before the final decision was made." Murray emphasized that the group does not take a position on Made in America, as residents' views are mixed. Neighborhood resident Alan Niederman, on the other hand, had no such hesitation. "It smothers our lives for close to three weeks," he said. "It's like a military occupation." He provided emails from a mayoral spokesperson dating from early June assuring him that the festival would no longer be sited on the Parkway. He wrote a letter to the Inquirer "congratulating Mayor Kenney for prioritizing the basic rights of the people who live in the Parkway area over the demands of Jay-Z." "He caved so quickly, and why?" Niederman said. "The mayor isn't representing the people that voted for him. He's representing a billionaire from Los Angeles." Festivalgoers climb a tree and are pelted with beer near the Liberty stage at the Made in America festival in 2017. The city said outreach is underway. "City officials reached out to several Parkway institutions before the joint statement was released yesterday," Sarah Reyes, Kenney's deputy communications director, wrote in an email. "We've continued to contact local stakeholders today and plan to meet with residents, civic associations and other institutions to garner feedback on ways we can overcome some of their concerns." And not everyone who lives nearby is concerned. Christopher Varano, president of the 2601 Parkway condo association, said his building is divided: "You have people who don't care for the hassle, the traffic, the road closures, and then you have people who love seeing our building on national television and love seeing the Parkway turned into this magical landscape." He acknowledged that there was some whiplash: "People that do not want it here were thrilled to have it go, and upon hearing it's back were like, 'What?' "
The Parkway events study, which included a series of surveys, found a stark divide between the views of residents and event-goers. More than 60 percent of visitors said they like having music festivals on the Parkway, while only 26 percent of residents felt the same way. >>READ MORE: What does eviction of Jay-Z's Made in America mean for the Parkway? Personally, Varano thought Jay-Z's op-ed made some sound points about the economic impact of Made in America, the $3.4 million it's paid in rent to the city, the 1,000 local people it employs each year, and the $2.9 million it's given in local charitable donations. He just hopes that Kenney got some concessions from Jay-Z and his team in the latest round of discussions about the event. For instance, he'd like to see Roc Nation commit to investing more in event cleanup. As for Murray, the top complaint he hears is the noise level — and he's not sure how that could be mitigated. But other fixes, like shortening the setup and breakdown time for the event, providing residents with parking passes to nearby garages as the city did during the 2015 papal visit, and limiting road closures could go a long way toward restoring goodwill. He would also like to see an increased police presence in the neighborhood, where late-night disorderly conduct and public urination are frequent problems after Parkway concerts. Kenney on Monday told reporters he was eager to put the Made in America fiasco behind him. "I just wanted to get this out of the way — this got so complicated and convoluted, I wanted to end the speculation," he said. But as far as residents are concerned, the conversation is far from over. "There are too many events on the Parkway," Murray said. "The Parkway is overstressed, and we do need to find other locations for some of the events."